There is one food companion so loyal; it is there with us late at night and still there in the morning. It is pizza and we love it so much that across the country Americans consume an average of 350 slices per second. From Hawaiian to meat lovers, there are plenty of topping options, but President Bush said why stop there? Behold a child’s dream and a Neapolitan nightmare: the cheeseburger pizza. It comes complete with mustard, ketchup, and pickles. Cristeta Comerford, a White House chef since 2005, told reporters about the questionable combo during his tenure. 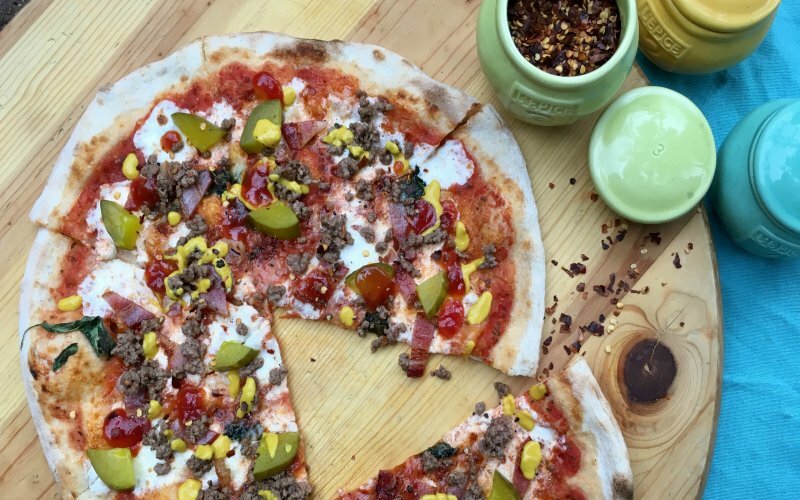 “For dinner, the President loves what we call home-made ‘cheeseburger pizzas’ because every ingredient of a cheeseburger is on top of a margherita pizza.” This bizarrely constructed hodge podge of a pie has made huge inroads. Most Pizza chains now have one on the menu and many of them are the most calorific selection. The Bacon BBQ Cheeseburger pizza from Pizza Hut weighs in at 650 calories a slice. In the same breath, Comerford also noted the Presidents dedication to working out. A slice a day does not keep the doctor away. The Bush family started with the Clinton’s White House Chef, Walter Scheib. The chef was known for sophisticated and rather complex cuisine. After some stylistic disagreements, he was replaced. “If you had a grilled cheese, a peanut butter and honey, and a BLT,” Scheib told reporters, “pretty much you’ll cover the culinary universe as far as [President Bush] is concerned.” There was also the issue of the scallops. The First Lady was not a fan and the more they appeared on the table, the less she enjoyed them. What she did enjoy was fresh American produce, with beets being a favorite. She also loved fresh pea soup with mint. The family was no fuss to feed, happy with comfort staples and repeat favorites. Unsurprisingly, the Bush family also was (and still are) great fans of Tex-Mex; the spicier the better. Huevos Rancheros were a particular weekend favorite which made the table most Sundays after church. Their first state dinner was appropriately given for Vicente Fox, President of Mexico. Crab and chorizo, followed by a pepita crusted bison gave both families familiar flavors they enjoyed. For snacking, it was tex-mex chex, a twist on the classic that the family created at the Texas Governor’s mansion. With hot sauce, cumin, and Worcestershire sauce, handfuls of it are quick to disappear. I had planned on doing Tex-Mex but this dish was too bizarre to ignore. I have included the White House pizza dough recipe and simple instructions for the assembly thereafter. I have enjoyed more pizza than the average bear, but I think I would give this one up for President Garfield’s squirrel soup or Fillmore’s pickled eggs. You have to try everything once. If you are in DC October 29th: Please join “Soulfood Scholar” Adrian Miller and I on the morning of October 29th as we share recipes and explore the legacy of African American White House chefs at the Smithsonian Food History Weekend. A complete guide to the presentations and events can be found here. Put 2 Tbsp. of the water, the flour, yeast, and honey in a stainless steel bowl. Stir together, cover with plastic wrap, and let stand in a warm place until doubled in size (20 minutes). Knead the dough a bit to get any air out. Roll out the pizza dough on a heavily floured surface until ½ inch thick. Let sit for 15 mins. before baking. Top the dough with crushed tomatoes, mozzarella, and basil. Bake for 12 mins. Add bacon, beef, pickles, and additional cheddar (if desired). Return to oven for additional 3 mins. Dress with ketchup and mustard. Serve. Posted on October 25, 2016 by Ailsa von Dobeneck and filed under main event, time travel, pizza and tagged pizza burger cheese pickles.